Learn how to open elevated command prompt on your Windows system. Why do we need elevated command prompt? Starting from Vista, Windows has two modes for running command prompt – Elevated and normal. Normal command prompt does not allow to run commands that require admin privileges, so elevated command prompt is required. For example, you want to add a new user account to your system, this requires admin previliges, so even if you are admin, you would not be able to add a user from a command window opened in the normal way. Below are different methods for opening an elevated command prompt. There are two ways to open elevated command window. These are explained below. Click on the Start button in the taskbar. Type ‘cmd’ in the search box. In the results, you will see cmd application. Right click on it, and select the option Run as administrator. User Account Control will prompt Do you want to allow the program to make changes to your computer? Click on Yes and elevated administrator command prompt window will be opened. 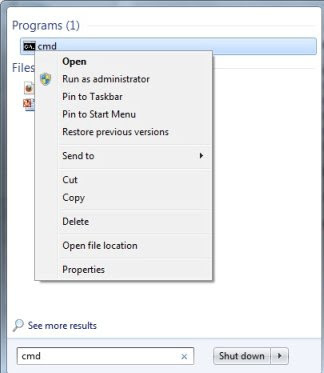 The alternative way is to search for cmd in the start menu search button as mentioned above. Press Ctrl–Shift and click on the cmd application. This works on all Windows editions – Windows 7, 10 and Vista too. Is there any method that I can see all computers conected in local network ? I writed ” net view ” but this show me little computers conected , I want to see all computers in the company ..
Got a Command line version? How to add admin Grp to User profile. I cannot open in CMD in Admin mode. Thank so much for this advise!!! Elevated command prompt was introduced from Windows Vista. This did not exist in XP and previous editions. This does not work for windows 10. Sorry. I did exactly as described and “System Error 5 Access Denied” still appears. Why does microsoft do everything in its power to screw its customers over? ** User Account Control will prompt “Do you want to allow the program to make changes to your computer?” Click on Yes and elevated administrator command prompt window will be opened. The above instruction will not work for me because when the box opens up asking “Do you want to allow the program to make changes to your computer” there is not option for ‘yes’, only ‘no’. So all I can do is select no and I’m back to the same problem. I can’t make changes to my antivirus or any other programs, even though my account should be an administrator account. I am NOT able to reset my forgotten Administrator password using my regular user account. It keeps asking me Administrator password otherwise it says “System error 5 has occurred – Access is denied”. I am NOT able to open “Elevated Command Prompt” because it will have a “Password” space to be enter” and I CANNOT continue after this message pop-up “Do you want to allow the program to make changes to your computer? I CANNOT Click on “Yes” since there is a “PASSWORD space” I have to enter before clicking “Yes”.